Given the way we deal with personal injury claims on a ‘no win- no fee’ (or ‘speculative’) basis at Moray Claims / Grigor & Young, we have to have ‘After the Event’ (‘ATE’) insurance in place. ATE insurance is “after the event” in the sense that your accident was the “event”. If you did not have any ‘Before the Event’ insurance in place (e.g. legal expenses insurance included as part of your house contents insurance) and you do not qualify for legal aid, we need to find another way to insure against the risk that your claim will be unsuccessful and a court makes an award of costs/expenses against you. ATE insurance insures against that risk of adverse costs. In this article, we will consider three questions related to ATE insurance and the speculative fees agreement we get you to sign in conjunction with the ATE insurance. 1. Is the ATE insurance only necessary if the case goes to court? The ATE insurance is only ‘needed’ if the case goes to court. It is only once the claim is in court that there is any risk of the opponent (usually an insurer) getting an award of expenses (costs) against you. However, we are not allowed to ‘cherry pick’. If we only took out policies for cases that go to court, we would be in breach of the terms of our agreement with the insurers (in our case, those insurers are ARAG). We have to insure all cases (that are not covered otherwise by BTE/LEI insurance or legal aid). In many cases, the claim does not require to court at all. It settles by negotiation. Does that make a difference? – see further below. 2. The speculative fee agreement contains reference to a ‘Success Fee’ – how does that work? This is an entitlement, in theory, for the solicitor to add a percentage amount to the hourly rate charge for our work which is agreed in the speculative fee agreement. We do not usually charge for our work in a successful speculative case on an hourly rate. We get paid by the third party insurers either on the pre-action protocol scale (if the case settles before going to court) or by way of judicial expenses (if the case concludes successfully only after a court action is raised). We also do not usually charge a success fee. Usually this will be expressed in the speculative fee agreement to the effect that the success fee “will be an amount equal to zero percent of the client/solicitor fee”. In other words, there is no success fee. The bottom line is that the arrangement means you pay nothing. You pay nothing if the case fails and you lose nothing from your compensation if the case wins. The only exception in a winning situation is if – with your agreement – we decide that the claim should be litigated in the Court of Session (because we think you would get enhanced compensation for your “pain and suffering”). In that case, we have to involve Edinburgh solicitors to help us (the Court of Session is in Edinburgh) and we cannot guarantee no loss from the compensation; if we do that, it’s a calculated risk that your gain in compensation will more than outweigh any loss in having to pay some fees. 3. Is the ATE insurance compulsory? The ATE is “compulsory” if we’re not able to run the case under either legal expenses insurance (LEI) / before the event (BTE) insurance or under legal aid. The reason for that is because, if it’s not LEI/BTE or legal aid, by default, it is no win-no fee. If it is no win-no fee and we don’t insure it we are ‘cherry picking’. In other words, we are doing the ATE insurers out of money for the insurance premium. Clearly, there is an incentive for us to cherry pick. We only “need” to have insurance if the case goes to court (to guard against the risk of a contrary award of expenses (costs) if the claim fails) but the way the premiums for ATE are worked out is by looking at all cases: some of which go to court and some of which do not. If we only insured the cases which go to court, the overall risks would be much higher for the insurers and so, in theory, the premiums would/should be higher. We could cheat the ATE insurers in this way but we choose to be scrupulous because, as we have seen with previous schemes, if enough people cheat the system, the whole system fails (this happened to a scheme set up by the Law Society of Scotland – called Compensure – in the early 2000s), no one can get affordable insurance and access to justice goes down the tubes. In any case, you have to remember that, just because liability is admitted in a case, it does not mean we’re guaranteed to settle the case by agreement. We may not be able to agree with the insurers on the value of the claim – which would mean that we would need to litigate to secure higher compensation. Even cases which look straightforward to the extent that they do not appear to require court action can often end up requiring litigation. 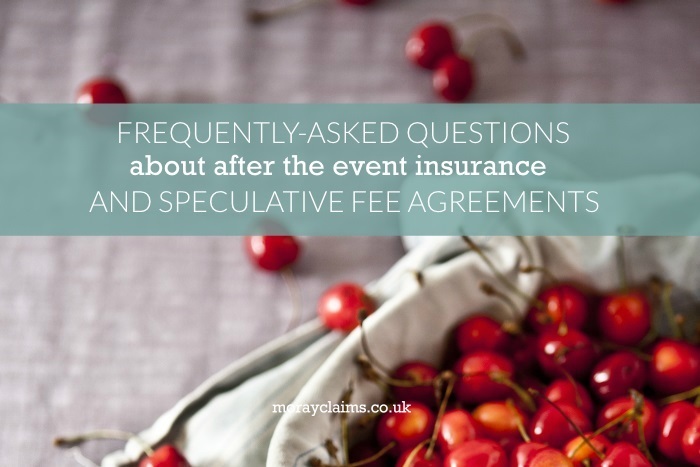 We hope you have found this article about aspects of after the event insurance and speculative fee agreements to be helpful. If you have any other questions about how they work, please get in touch with us. This can be quite a complex and difficult area. We are keen to simplify it as much as possible. Your questions help us to refine the content on the website.